I chanced upon three vehicles dressed in the visible colours of the Buddhist flag and one bearing a golden effigy of Buddha parading along Elizabeth Street while on a leisurely Saturday stroll in "Most Liveable Melbourne". Intrigued and in pursuit of the slow moving displays, I was led to the Buddha's Day and Multicultural Festival alongside platoons of Essendon vs Richmond fans marching steadily towards the MCG. Held at Federation Square for the 10th consecutive year, this Festival was made possible through the organisers Fo Guang Shan Melbourne and Buddha's Light International Association of Victoria, with the support of the City of Melbourne, Victorian Multicultural Commission and City West Water to encourage cultural diversity, understanding and inclusiveness. This annual event, celebrating its 17th festival, adds an interfaith layer to the already delicious multicultural cake which is Melbourne. As I transverse Federation Square in search of enlightenment regarding this important 2-day festival in Melbourne's cultural calendar, I found myself embarking on a brief pilgrimage of religion, arts, ceremonies, performances and food. The vivid image of a similar Buddhist festival in Singapore appeared in my mind. Commonly referred to as Vesak Day, it commemorated the birth and enlightenment of Buddha with the chanting of the sutras by monks and devotees praying and making offerings in the various temples. Acts of generosity such as the freeing of caged birds and giving alms to the poor and needy were observed. In Singapore, Vesak Day usually occurs in May, on the 15th day of the fourth month of the Chinese Lunar Calendar. Buddha's Day was Victoria's version with some localised interpretations and practices. The modern interpretation of the Bodhi Tree as a participative art installation with a small child statue of Buddha in the centre, made me ponder the birth of Buddhism with the journey of self-reflection by a man, Siddhartha Gautama, born in 623 B.C to the Indian kingdom of the Sakya Clan in present day Nepal. During his visit into town as a young adult, he witnessed life's inevitability of sickness, old age and death. He realised the transient nature of worldly pleasures and was determined to better understand life's sufferings. Upon this conundrum he meditated for many years. Under a Bodhi Tree at Buddha Gaya in the district of Bihar in Northern India more than 2500 years ago, he attained enlightenment where he created Buddhism, the eightfold path, the five precepts, and the three marks. Thus the word Buddha means "awakened one" or "enlightened one". Siddhartha Gautama became Gautama Buddha or Sakyamuni Buddha as more commonly referred to by Asians. Unfortunately his teachings were written down only some 200 to 400 years after his passing (depending on who you ask), and many of his original teachings were lost. Through his enlightenment, Siddhartha Gautama proved to fellow Indians of his era that they could cross from a world of ignorance, war and suffering to a new world of love, peace and happiness. My best guess at enlightenment could be waking up with a higher level of psychic awareness of mind, body and the world around you, having developed all your positive qualities. Regardless of the explanation, I have to agree that enlightened is he/she who knows love, peace and happiness especially in our modern material age. The main feature that caught my eye as I progressed from the Bodhi field was the specially constructed Buddha's Stage in the centre of Federation Square containing a large gold and white effigy of Sakyamuni Buddha in a seated position. The Stage was used for several important ceremonies. 1) Purification Ceremony where the Abbess and Venerables of Fo Guang Shan Melbourne chanted from an important Buddhism text or Mantra dedicated to the Guanyin Bodhisattva to mark the commencement of this important festival. 2) Interfaith Ceremony where prayers or readings from several faiths were shared including Brahma Kumaris, Christian, Islamic, Sikh and Buddhist. 3) 2012 Annual World Peace Blessing Ceremony, where devotees of Fo Guang Shan Melbourne participated in a mass offering and traditional Buddhist chanting. A Chinese lion and dragon dance added colour, music and energy to the proceedings. 4) Light Offering Ceremony which symbolised the practice of giving and gratitude, replacing ignorance with wisdom and blessing for one's mind, body and soul through the chanting of a healing Mantra. It also served as an offering of peace between peoples of the world. The reference to Guanyin Bodhisattva triggered a recall of my high school history lesson about the Indian and Chinese civilisation in the age of Buddhism. Indian Buddhism or Hinayana Buddhism as some refer to, had undergone doctrinal changes through the monastic rules and the widespread adoption of teachings in the first century C.E., to form another version known as Mahayana Buddhism or the Great Vehicle. The key distinction is that enlightened beings called bodhisattvas who are the manifestations of the great compassion in Buddhism, help and guide fellow human beings to obtain final enlightenment or nirvana. One such bodhisattva highly regarded in Singapore and Malaysia is Guanyin also commonly referred to as "Goddess of Mercy". Mahayana Buddhism is commonly practiced in North Asia, including China, Mongolia, Tibet, Korea, and Japan where a vast pantheon of bodhisattvas are venerated and their sutras are read. It adopted and reflected distinct local cultural characteristics as it spread out of Indian and this explained the difference between the Mahayana pantheon in India and rest of North Asia. Mahayana Buddhism was first propagated into China by the Kushan monk Lokakṣema, who translated the Mahayana scriptures or sutras in local tongue between 178 and 189 C.E. It flourished during the beginning of the Tang Dynasty (618–907 C.E.). From its Dynastic capital of Chang'an, (known as Xi'an today) Buddhism spread to Korea and Japan. Through individual Chinese missionaries, it arrived on Singapore shores in 1884. Hinayana Buddhism which focuses on seeking one's own path to enlightenment is still practiced by Sri Lankan and Burmese communities, where cooking a pot of rice in milk, reminiscent of Sakyamuni Buddha's last meal before his journey to enlightenment, is a ritual. As I approached Buddha's Stage, I witnessed devotees and tourists alike partaking in "bathing" palm-size standing figurines of child Sakyamuni Buddha at a long altar arranged as a flower garden, representing the Garden of Lumbini where the Buddha was born. This ritual "bathing" makes reference to the legend of the child Buddha being showered with the waters of nine celestial dragons soon after birth. The act is a symbol of purifying oneself of sins and one's mind of ignorance, greed and anger. I participated in a similar ceremony in the Ganko-Ji Temple near Nara, Japan where Melbourne's celebration of the birth of Sakyamuni Buddha is known as Hana Matsuri. Japanese Buddhists gathered around a flower-decorated shrine containing a statue of the infant Buddha to pour sweet tea on the statue in the same ritual bathing also known as the Kambutsu (Anointing the Buddha) Service. I was surprised to learn that Victoria is home to people from over 250 countries, speaking 290 languages and dialect and practicing over 130 religious and spiritual faiths. Buddhism has a strong history in Victoria since the goldrush days in 1848 and is the second largest religion in Australia after Christianity. 2.1 percent of the total population, or 418,749 people were identified as Buddhist according to the 2006 census. It also experienced the highest percentage growth of all religions in Australia, with a 79 percent increase in its number of adherents from the 1996 to the 2001 census. This could be largely due to the immigration in the 1970s from South East Asian countries like Vietnam where Buddhism was widely practiced and in the later decades from China, Hong Kong, Taiwan, Japan, Korea, India, Sri Lanka coupled with spread of Tibetan Buddhism to the western world. As Buddhist communities around the world celebrate Vesak, Victoria will also observe the United Nations Day of Vesak. Hungry from too much recollection of history lessons and fond memories, I made my way to the sounds and smells of vegetarian food. I was greeted by a row of stalls dispensing a buffet of vegetarian meals including Taiwan style noodles and beancurd, sticky rice, deep fried bun, turnip cake, laksa, spring roll, mock roast duck, lemon chicken, curry fish and mutton noodle soup. The organisers also included cooking demonstrations with chefs and cooks from various Melbourne food establishments for visitors interested in preparing "Vegi-licious" meals. Unfortunately my survey of the stalls did not reap me any Buddhist cuisine rewards. I enjoy Buddhist vegetarian meals of mock-meats, stir fried vermicelli, deep fried gluten sheets, braised rolls of thinly layered gluten, mixed vegetable and mushroom pots prepared by Buddhist temples and select restaurants in Southeast Asia and Hong Kong. I was disappointed to find none available. Missing too were the rich and robust Southern Indian vegetarian cuisine and the sweet subtle flavours of Japanese vegetarian recipes. With my tummy running on empty, I experienced briefly the fasting Sakyamuni Buddha undertook on his path to enlightenment. Unfortunately my overwhelming desire for food was unravelling any sense of inner peace. So I was off to seek gastronomic tranquillity. 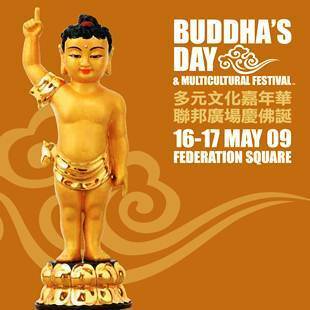 My brief pilgrimage of the Buddha's Day and Multicultural Festival added another page to Lionel's Melbourne. Magnificent in a multi-faith and multicultural dress, I glanced into another piece of her heart and soul. And it was one of harmony and love.